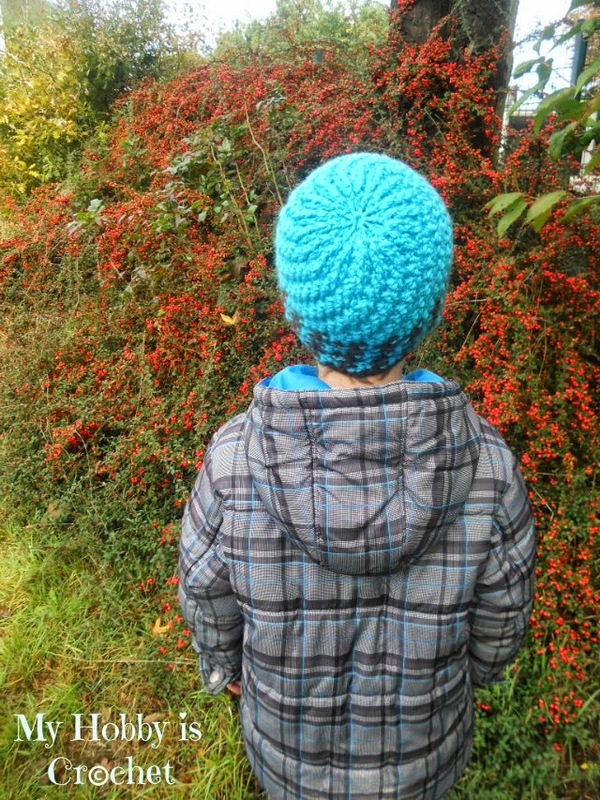 This is a chunky, warm hat, perfect for winter! It is very stretchy, that's why can fit a 6 year old child, but also an adult woman! 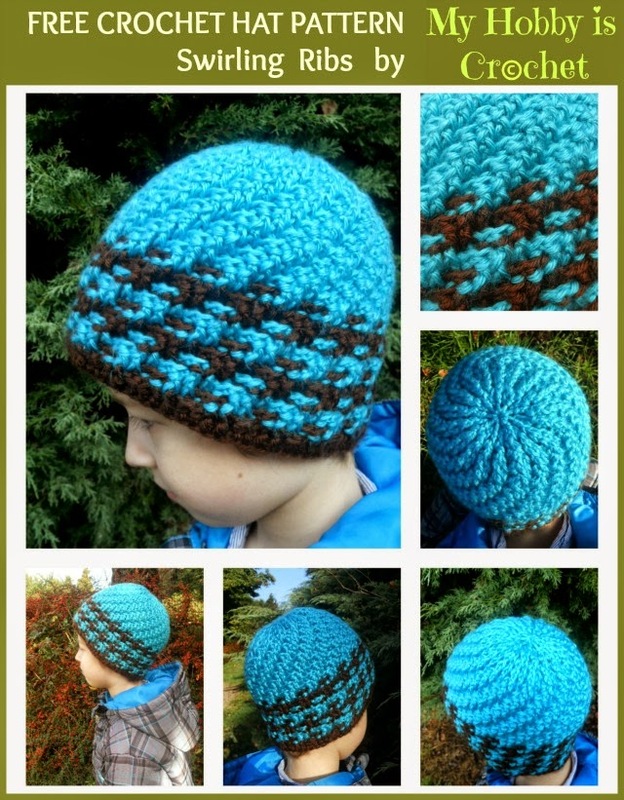 You can work the hat using one solid color or 2 colors, alternating the colors for an interesting effect. I think it would look amazing using just one solid color! It's a unisex hat, for both boys and girls; just use other color(s) for a girlie look and add a flower embellishment, if you wish! You can adapt the size of your hat, making it bigger or smaller. The easiest way is to change the size of the hook and the weight of the yarn used. Other way is to start with more/less stitches as in the pattern required; the total number of your stitches should be a multiple of 4! Also adjust the numbers of the rounds, until the desired length! - tapestry needle to wave in the ends. See my detailed Tutorial with Step by Step Pictures "Decrease front post double crochet, decrease back post double crochet and combined decreases". The hat is worked in rounds from bottom to top! 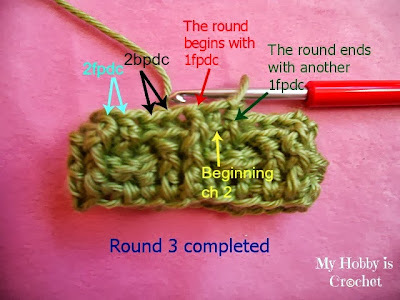 Use crochet hook size 4.5 mm till the round 7, then switch to crochet hook size 5 mm. 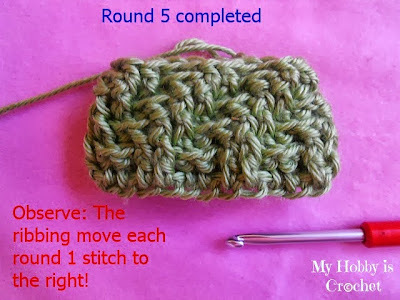 Each round starts with chain 2, ch2 does not count as a stitch! Each round ends with a sl st into the top of the first dc made, not into the top of beginning ch2! If you are not sure where the round starts and ends, mark your beginning ch2, so that you know you will not work in it. 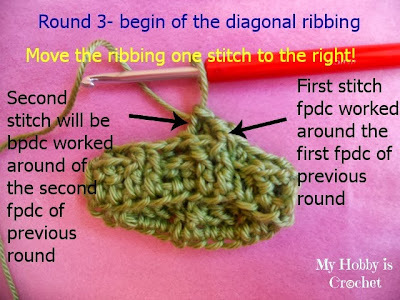 The pattern stitch for the ribbing is *2 fpdc stitches, 2 bpdc stitches * repeat around. The diagonal ribbing it's obtained by moving the ribbing each round one stitch to the right. Tip: I always count my stitches in the round this way: 1, 2 for the front post stitches and 3, 4 for the back post stitches, always repeating 1,2, 3, 4... 1, 2, 3, 4. :) I don't get confuse this way. The last 4 rounds are decrease rounds. 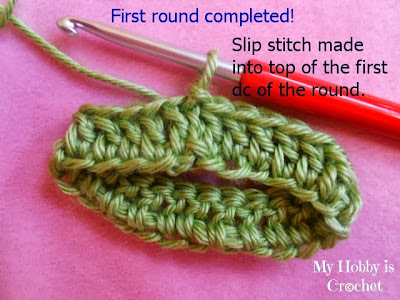 For the CHARTED PATTERN click on this link: Charted Pattern of the Swirling Ribs Crochet Hat!! The pattern repeats after each 4th. round, starting with round 2! With yarn color A and a 4.5 mm crochet hook, ch 72 stitches a little loosely, join in round with sl st into first chain made. Or you can start with 72 foundation chainless single crochet row, for more elasticity. Note: In all the pictures below, it is only a reduced sample of the pattern, without the color change! In each round you should have 72 stitches total, till the decrease rounds. ch2, *1fpdc round each of the next 2sts, 1bpdc round each of next 2sts *, repeat around from * to *; sl st with yarn color B into top of first fpdc. 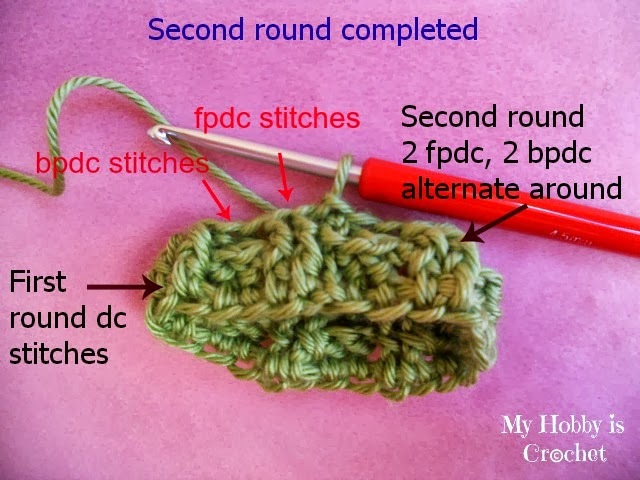 Round 3: Continue with yarn color B, ch2, 1fpdc round first st, *1bpdc round each of the next 2 sts, 1fpdc round each of next 2sts*, repeat around, ending with 1fpdc round last st; sl st into top of first fpdc. Round 4: ch2, *1 bpdc round each of next 2sts, 1 fpdc round each of next 2sts *, repeat around, sl st with color A into top of first bpdc. Round 5: Continue with yarn color A, ch2, 1bpdc round next st, *1fpdc round each of next 2 sts, 1bpdc round each of next 2 sts*, repeat around, ending with 1bpdc round last st, join with yarn color B into top of first bpdc. Round 6: work the same as Round 2, but with yarn color B : ch2, *1fpdc round each of next 2st, 1bpdc round each of next 2sts *, repeat around, sl st with yarn color B into top of first fpdc. Round 7: Change to hook size 5 mm!!! Ch2, 1fpdc round next st, *1 bpdc round each of next 2st , 1fpdc round next 2 sts*, repeat around, ending with 1 fpdc round last st. sl st into top of first bpdc. Round 8: work as Round 4. Round 9: work as Round 5. Round 21: it's a decrease round. You will decreases only the bpdc stitches 2 together!! See the Step by Step Tutorial Decrease back post double crochet 2 together! Round 22: (decrease round) Decrease only the fpdc stitches 2 together!! 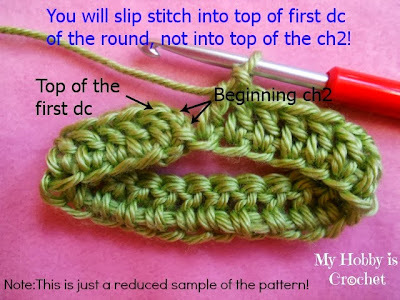 See the Step by Step Tutorial Decrease front post double crochet! ch2, *1bpdc round next bpdc, 1fpdc dec *, repeat around, sl st into top of first bpdc. 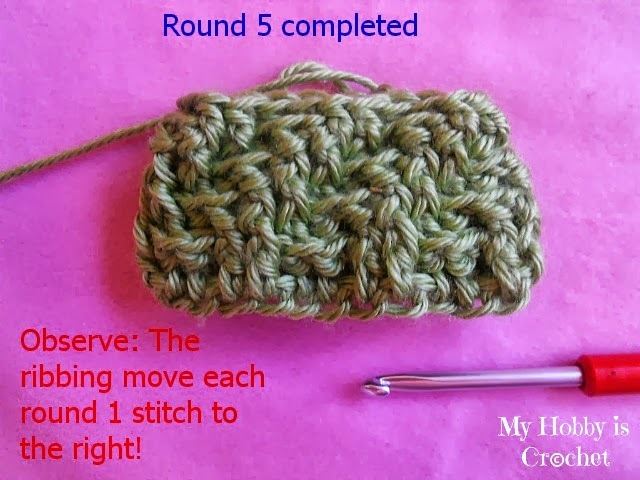 See the Step by Step Tutorial Combined decrease front post and back post double crochet! Leaving a long tail, cut yarn, fasten off. 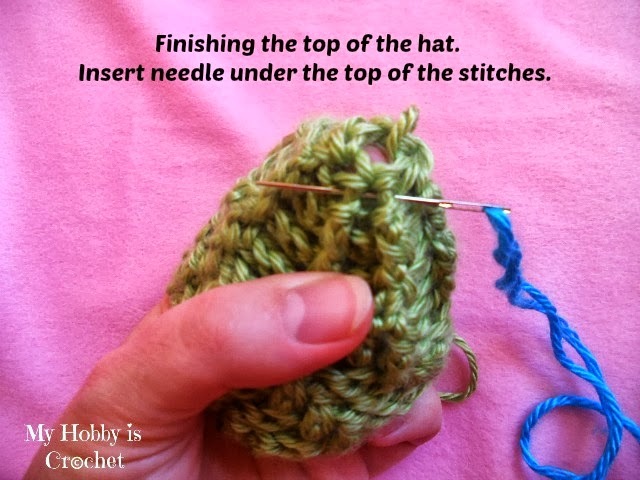 Thread yarn on tapestry needle, stitch under the top of each stitch around the hat top, pull yarn to close the opening. Fasten off. Weave in the ends. I hope you enjoy this pattern! I would love to see your hats made using this pattern! 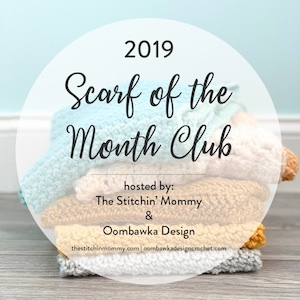 Please share pictures of your projects on my Facebook Page Myhobbyiscrochet! Another great pattern! I made one with two alternating colors throughout - switching colors between the FPDC and BPDC. It turned out very cool! I admire your ingenuity and the patience necessary to produce such great patterns for hats that fit well. Thank you once again.